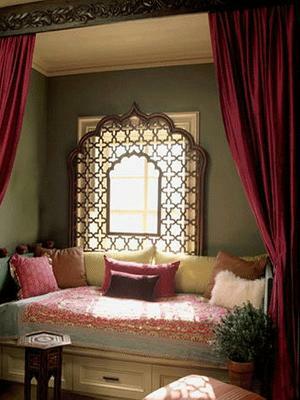 People all over the world appreciate and admire Moroccan style furniture and decor accessories, unique textiles and home decorating fabrics, spectacular patterns and handmade home decorations that are important parts of sensual Moroccan interior design. 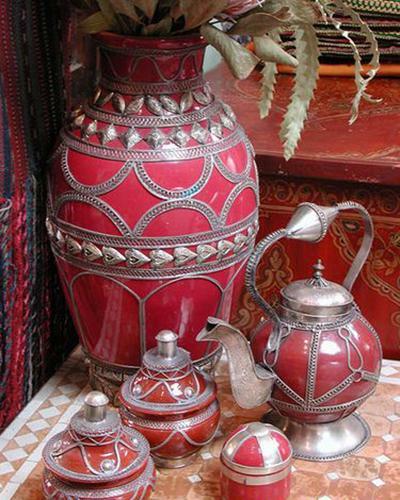 Moroccan home decorating and interior design ideas are about rich room colors and ethnic decoration patterns, traditional crafts and modern artworks, wonderful Moroccan decorations made of dark wood, leather or glass, beautiful ceramics and forged metal Moroccan lamps. Beautiful pottery, bright tile designs, colorful home fabrics and intricate wood carving are essentials of Moroccan design. 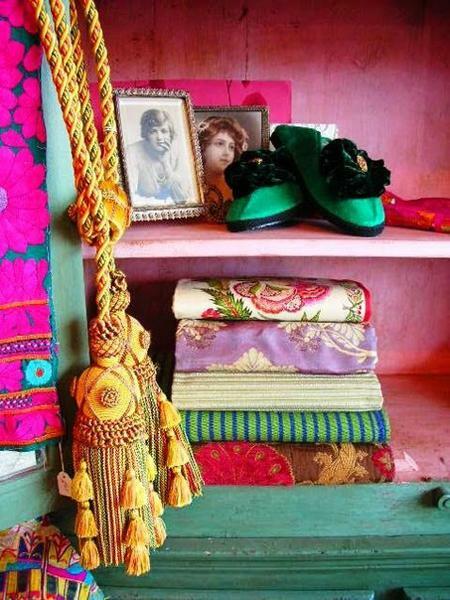 Natural decorating fabrics and colorful area rugs with large cushions, the unique aroma of Moroccan argan oil and mint tea with local spices, dark wood Moroccan furniture and decor accessories are beautiful home decorating ideas for creating luxurious, colorful and modern Moroccan decor with exotic flavor. 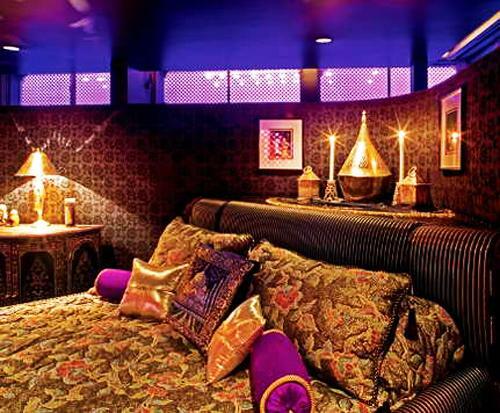 Moroccan architecture, interior design and home decorating ideas come from the ancient times and can be easily recognized today even in contemporary Moroccan home decor. 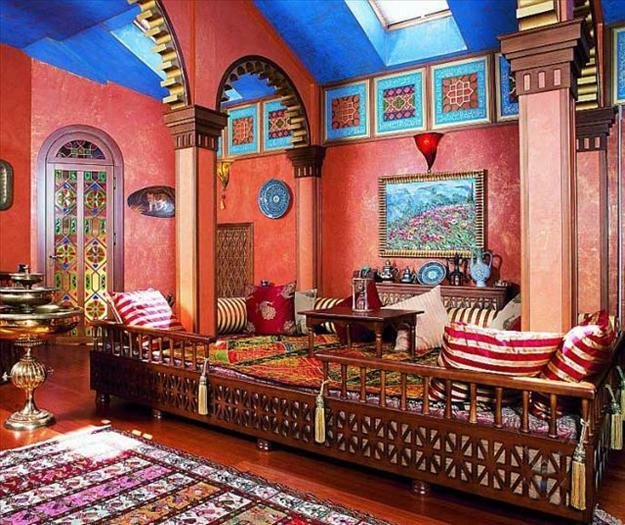 One of the main principles of Moroccan interior design is utilizing all available empty surfaces and decorating them with impressive Moroccan decorations, intricate patterns and juicy colors. 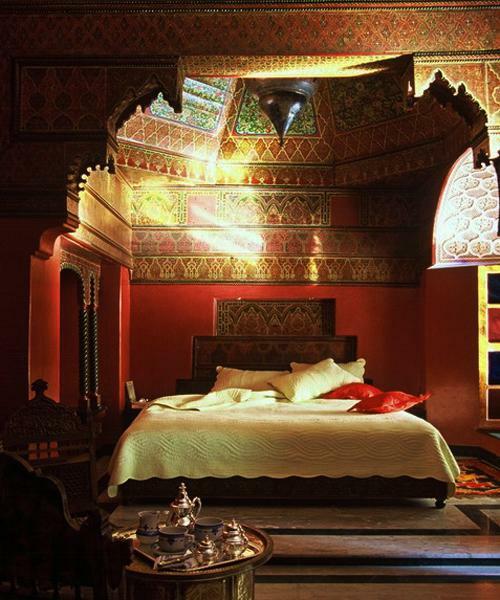 Since images of people are forbidden in Muslim art and design, Moroccan interior design is based on creating interesting geometric shapes and decoration patterns, arabesques and flower motifs on the floor, ceiling, walls, lighting fixtures, furniture and decor accessories. 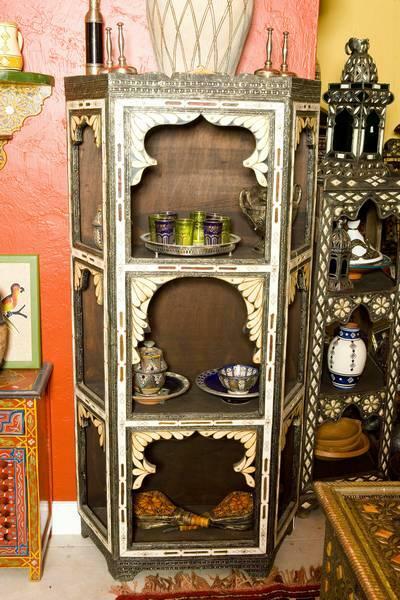 Made of stucco, plaster or wood, handmade Moroccan decorations are impressive. 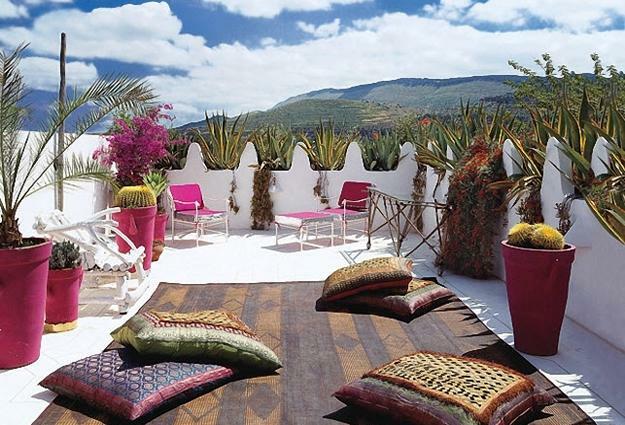 Moroccan home decorating fabrics feature fabulous patterns and bright color combinations. Natural materials, beautiful textiles and home decorating fabrics created with natural fibers make Moroccan interiors attractive, comfortable and pleasant. 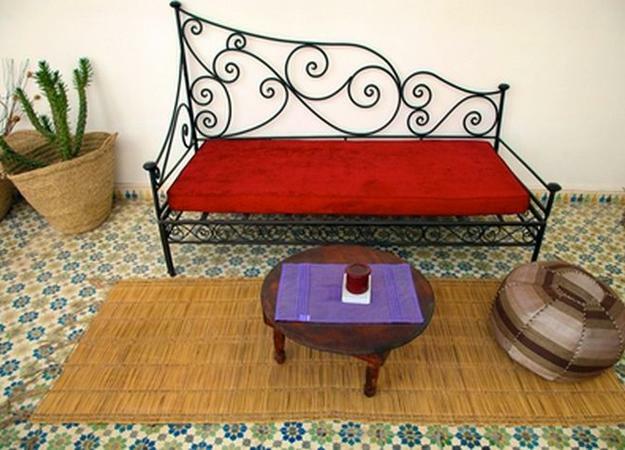 Moroccan furniture and decor accessories are made of natural materials, blending wool, silk, glass, leather, clay and metal into fabulous and unique home furnishings. Colorful and rich Moroccan wool rugs, carved wood furniture and handmade Moroccan decorations, bright decorative cushions, made of cotton, wool or silk fabrics, Moroccan bedding, light decorative curtains and unique Moroccan lamps are functional and beautiful home furnishings for traditional and modern Moroccan interiors. Use elegant silk for decorating your home with curtains, bring bright rich room paint colors and add ethnic character to modern interior design in Moroccan style with ethnic patterns. Soft luxurious home decorating fabrics, floor rugs and pillows with gorgeous patterns brighten up modern interior design in Moroccan style and create cozy and inviting rooms. 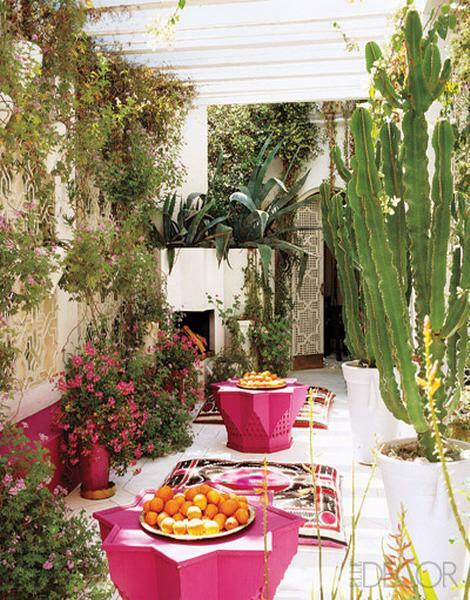 Add the Middle Eastern flavor with leather, glass or forged metal Moroccan lantern designs. 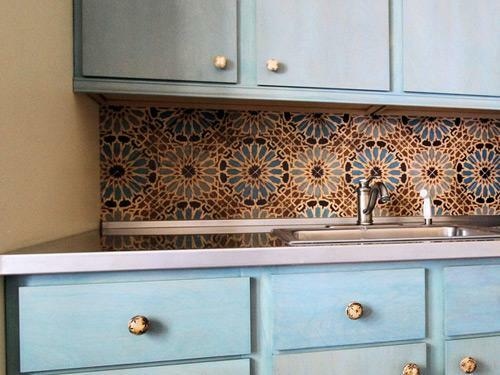 Add clay pottery to emphasize the exotic Moroccan style. 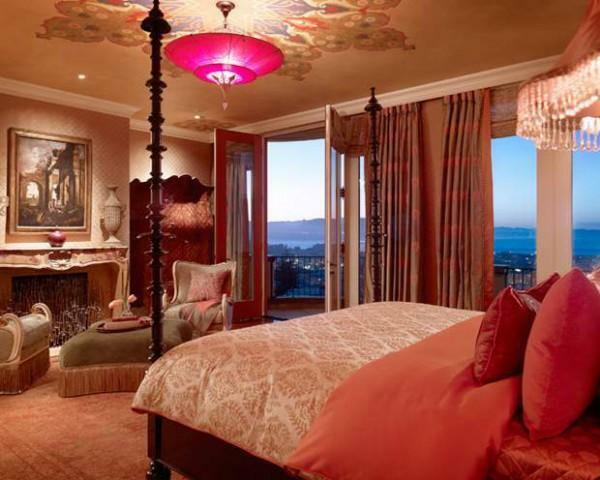 Moroccan style calls for rich room colors and ethnic interior design ideas that include carved wood furniture, doors, wall mirror frames. and Middle Eastern or African decor accessories, – wool rugs, silky curtains and bedding fabrics with traditional patterns, Moroccan lamps made of ceramic, leather, glass or forged metal. 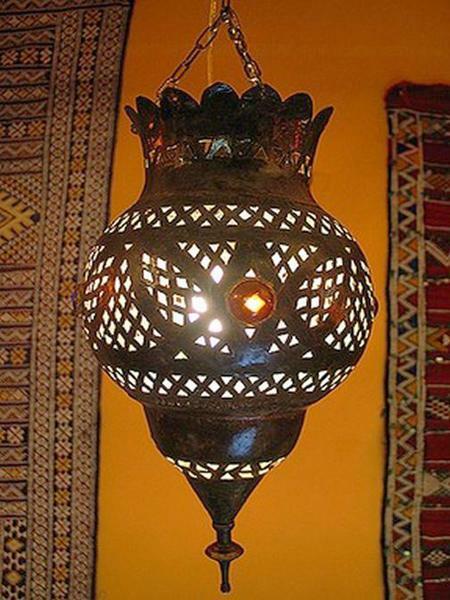 Forging refines the metal grain structure, allowing to create intricate and amazing Moroccan lamps. These lighting fixtures, combined with forged metal kitchen items, tea accessories and vases, add wonderful, unique and beautiful accents for Moroccan interiors. 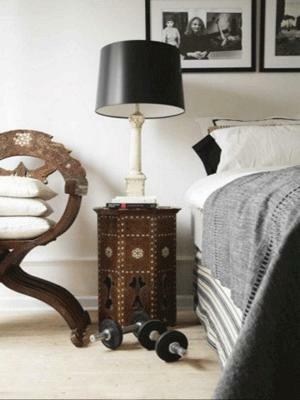 Made of forged metal handrails, furniture decoration, floor and table lamps, mirror frames, pendant lights and Moroccan lanterns make modern interior design look unique and charming, enhancing the Moroccan style. Using bright and colorful wool rugs, kilims or thin large rugs with traditional geometric patterns is the quickest way to Moroccan interior design. A few leather ottomans, or Moroccan poufs, and large cushions made of soft decorating fabrics add comfort and exotic look to Moroccan interior design and decorating ideas. 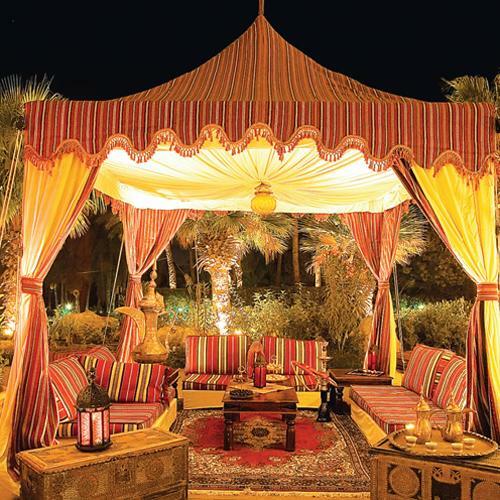 Silk canopies, which are inspired by traditional desert tents, attractively decorate Moroccan interiors and protect the sleeping, dining and seating areas. 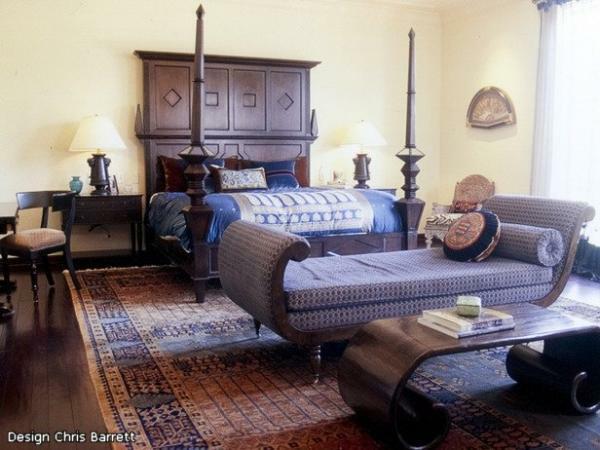 Rich room colors and ethnic patterns, traditional crafts and modern artworks, wonderful handmade Moroccan decorations, created of leather or glass, fantastic mosaic tile designs, ceramics and forged metal Moroccan lamps, combined with carved wood furniture and luxurious silky decorating fabrics that are used for bedding and curtains, make Moroccan style interior design so warm and comfortable, attractive and popular.